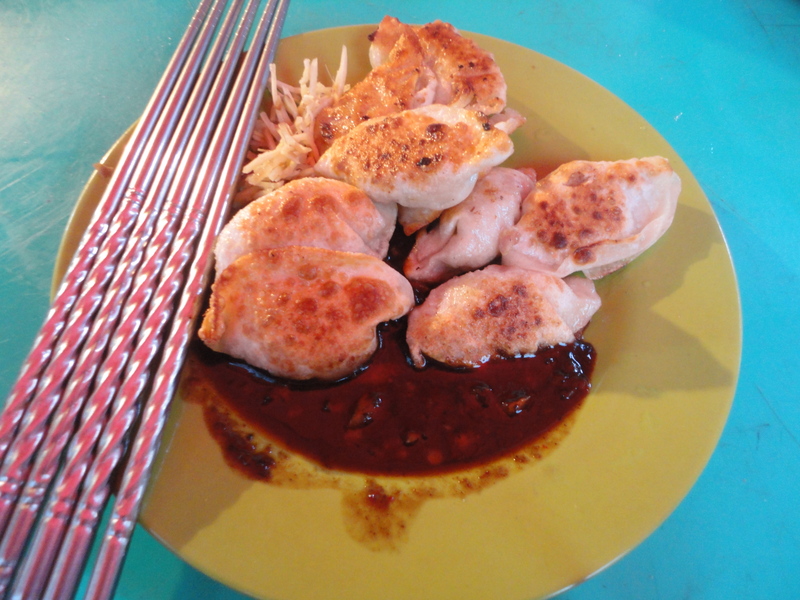 I believe if you are blessed with a strong stomach that can withstand different sorts of food, then you have the privilege of going on a street food trail everytime you visit somewhere new. It’s just pure fun walking along the street not knowing what kinds of food lie ahead. So without further ado, let’s continue with another delight of our Myanmar trip! 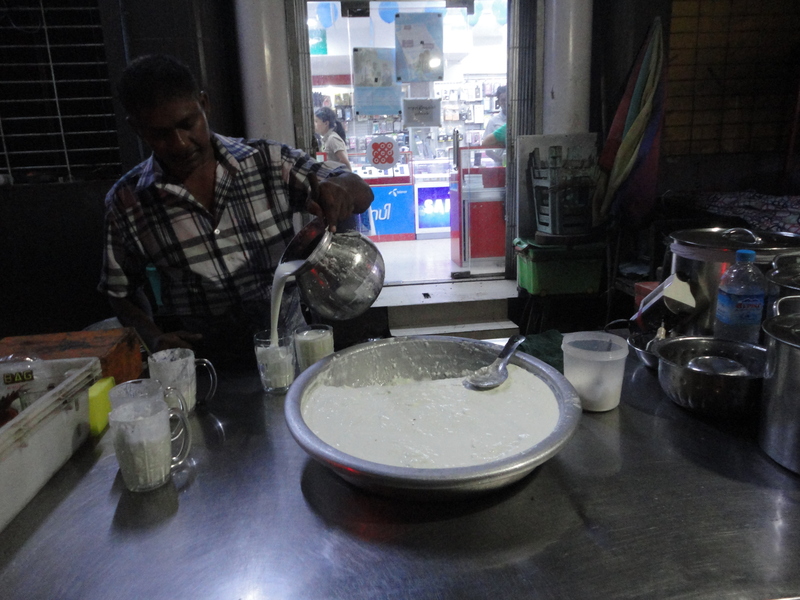 Our first stop was a tea shop in the food section of Bogyoke market where we drank milk tea and had naan (naan pya, pya meaning flat). 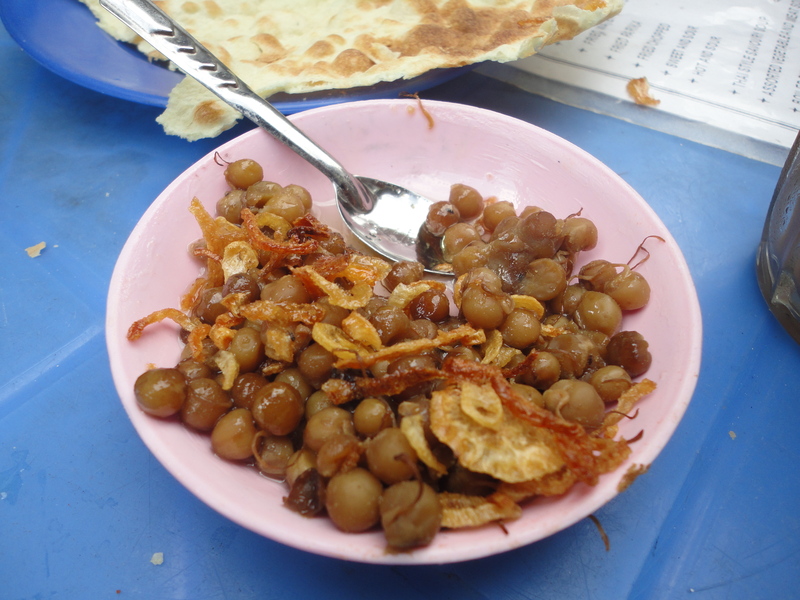 Naan in Myanmar is usually served with some stir-fried pea garnished with crispy and fragrant shallot. The naan was also crispy and I admit to a silly habit: I like to sniff them crazily (like really crazily) before eating them. The scent of such a simple snack has taken over me. 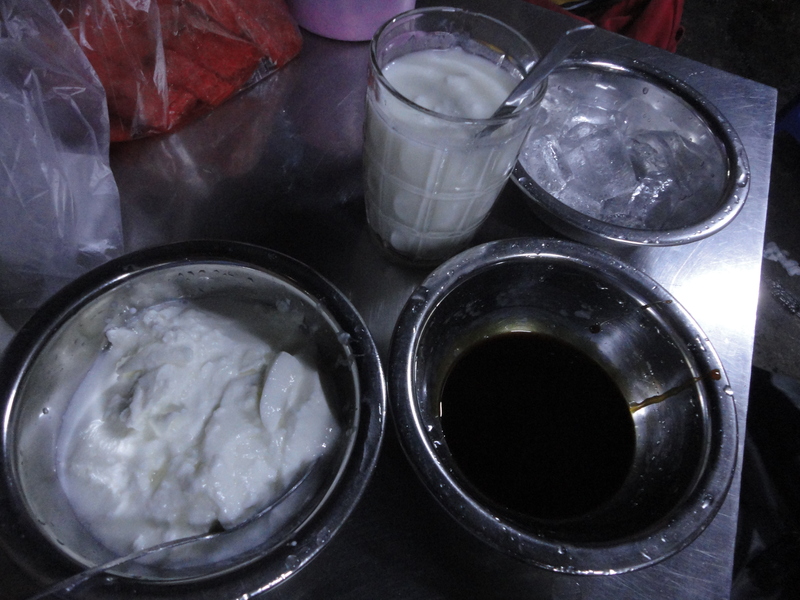 Within 3 hours in Chinatown in Yangon, together with my two street food experts, I was able to try from satay, glutinous rice dumpling to “spider” desserts (there’s a tiny spider in my bowl!) and yogurt. On a Friday night, the area was packed with people, filled with vendors chanting and chattering and each section of the street was infused with a scent of a particular stall, depending on which was more dominant. Dumpling in sweet sauce and pickled ginger. 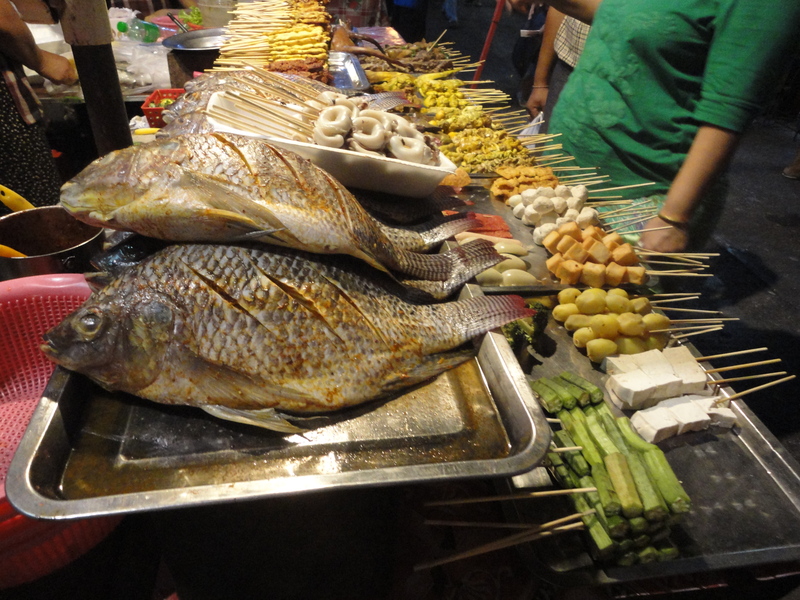 Spoilt for choice with BBQ seafood variety. For some peculiar reasons I didn’t take any photos of the dumpling, but this is the shop. 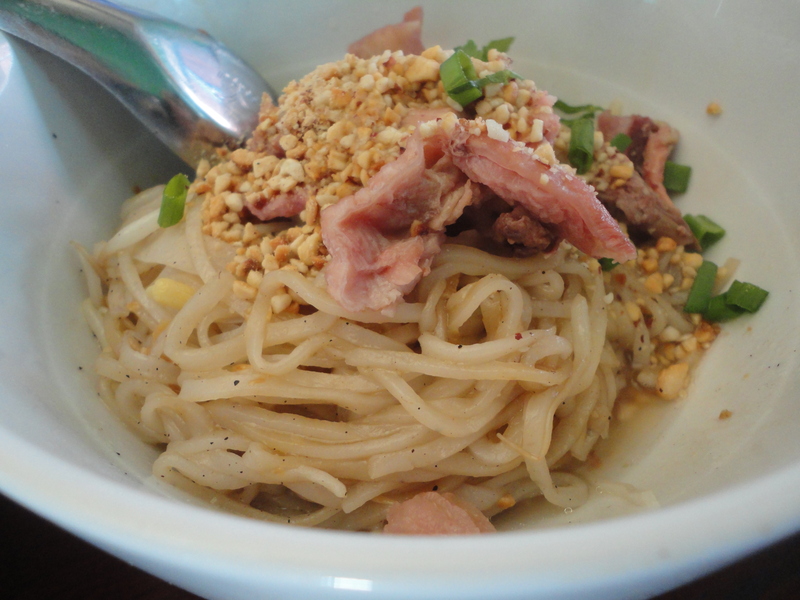 The most anticipated part of my trip was to try Shan noodle at its origin. It tasted nothing like the one I had in Singapore (in a good way). I used to think that the word refers to a noodle dish with tomato sauce, black sweet sauce, chicken strips and garlic oil. Apparently, it only refers to this particular type of noodle made from rice flour originating from Shan that looks very dry uncooked, but once soaked into hot water, it becomes sticky and starchy, and then can be used with different kinds of broth and sauce. 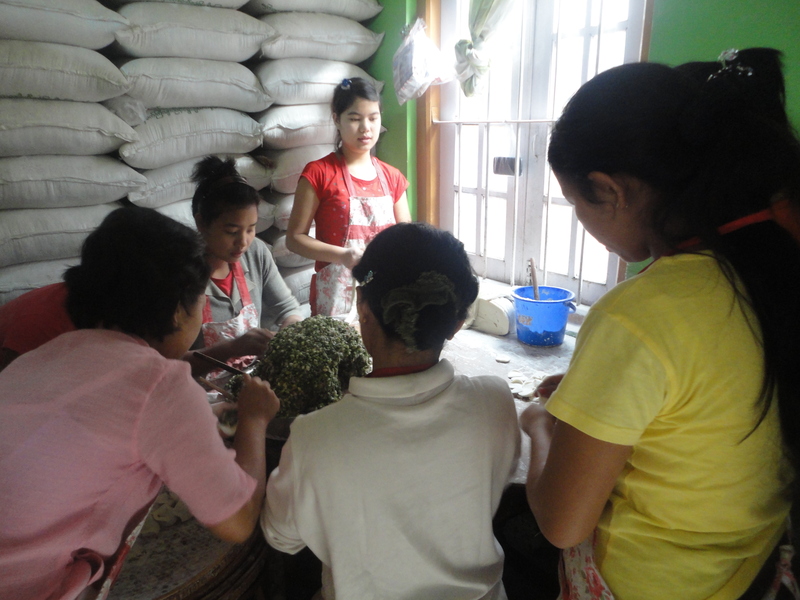 We managed to visit some of the most popular shops in Taungyi where you can expect full house any time in the morning. 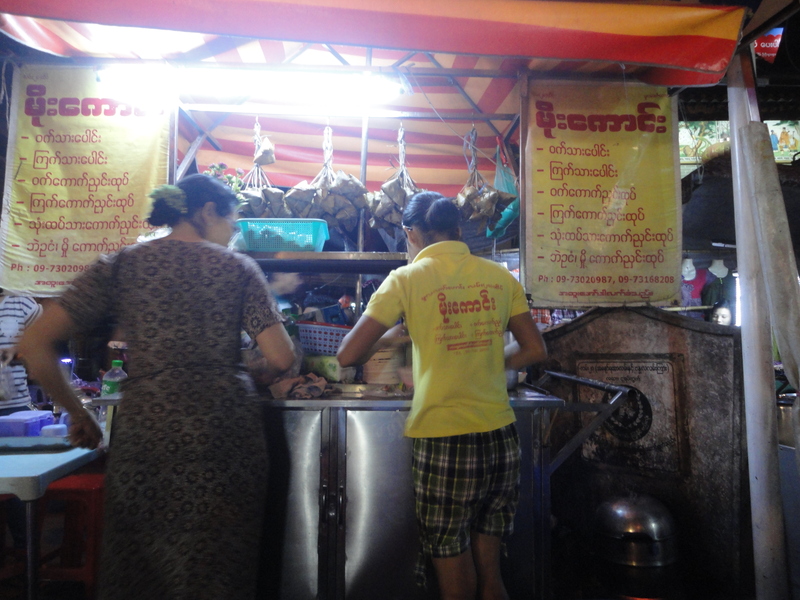 The first shop served both dry and soup noodle with chicken, pork and beef. I prefer the dry variation for the texture: I can taste peanut (yum! 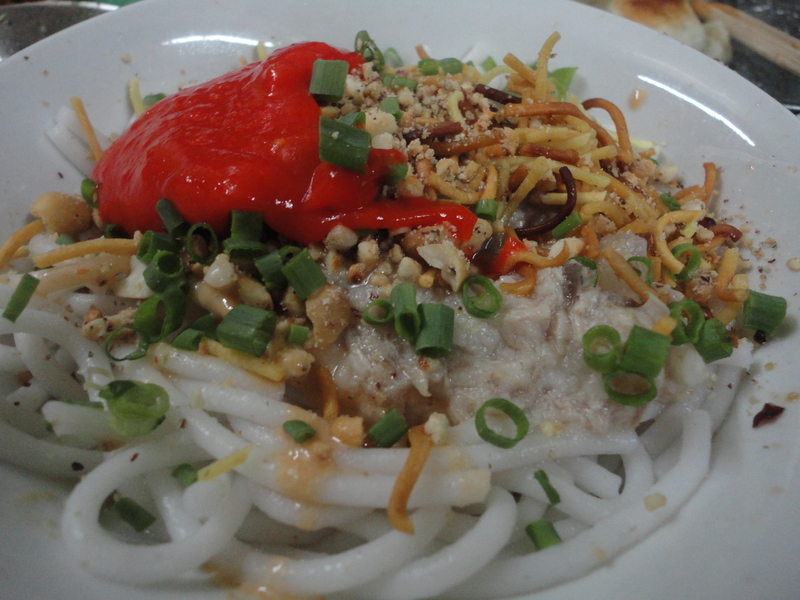 ), the sauce, and the sticky noodle, which is the most distinctive part of the bowl. 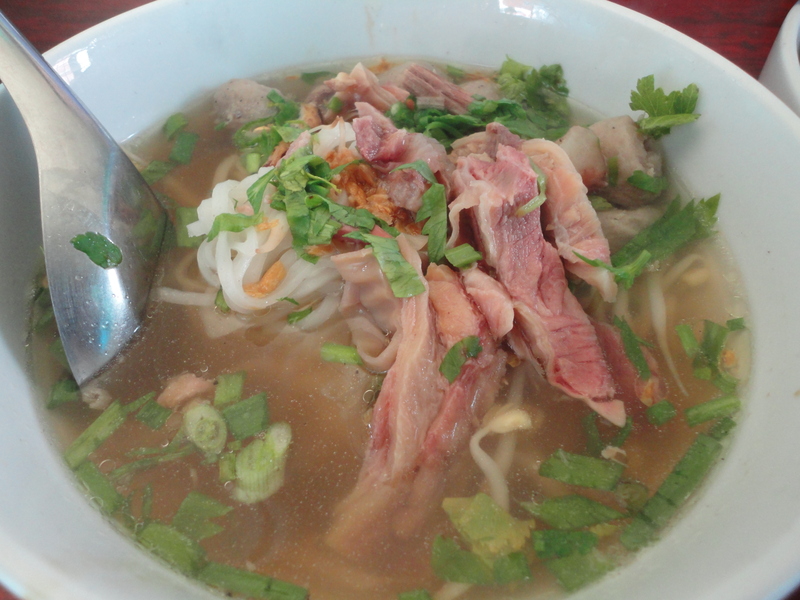 The beef noodle seems to be a relative of Vietnamese pho with a milder flavor. I’m telling ya, I don’t need any meat in my bowl, just the sticky noodle, crunchy bean sprout and peanut topped with some spring onion and I will be happy. YUMMMM my favourite, dry pork noodle. 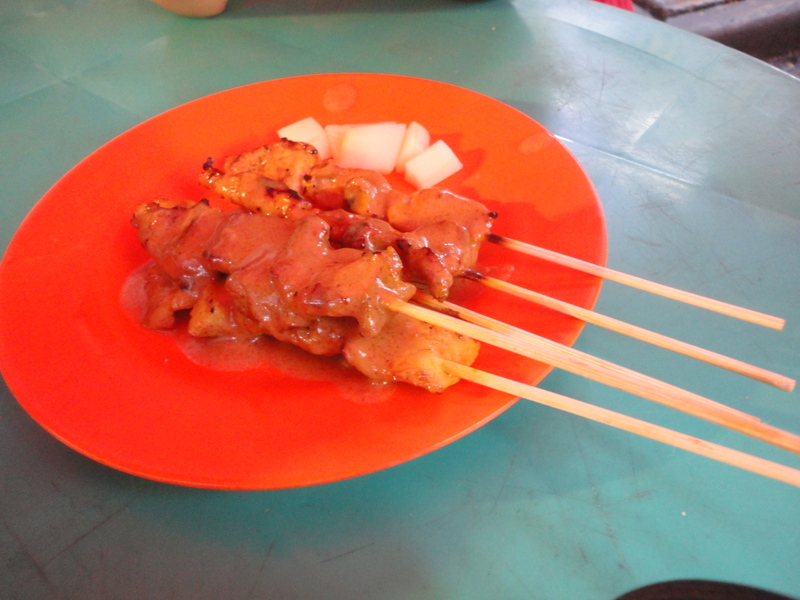 The owner told us the pinkish color from all the meat is the result of cooking a big piece of pork or whole chicken at low temperature for a very long time. Another shop sells dry noodle with meat sauce and a red sauce (which I’m not sure what it is but it tastes similar to the dumpling sauce in Yangon). And again the garnish is peanut (yay), crunchy bits (which I guess is fried flour) and spring onion. 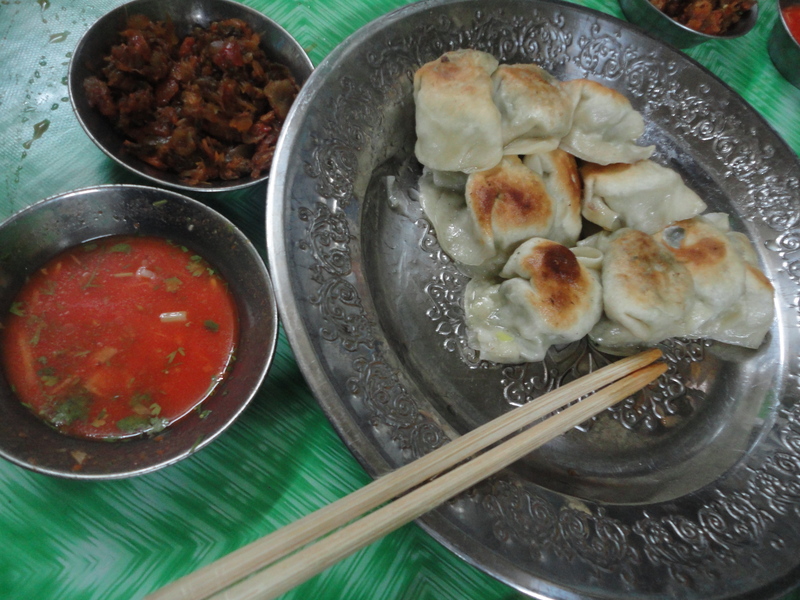 They are also famous for the handmade dumplings, juicy and fresh right out of the hand and the pan. These dumplings are a combination of Chinese xiao long bao (juicy filling) and Japanese gyoza (pan-fried finishing touch). 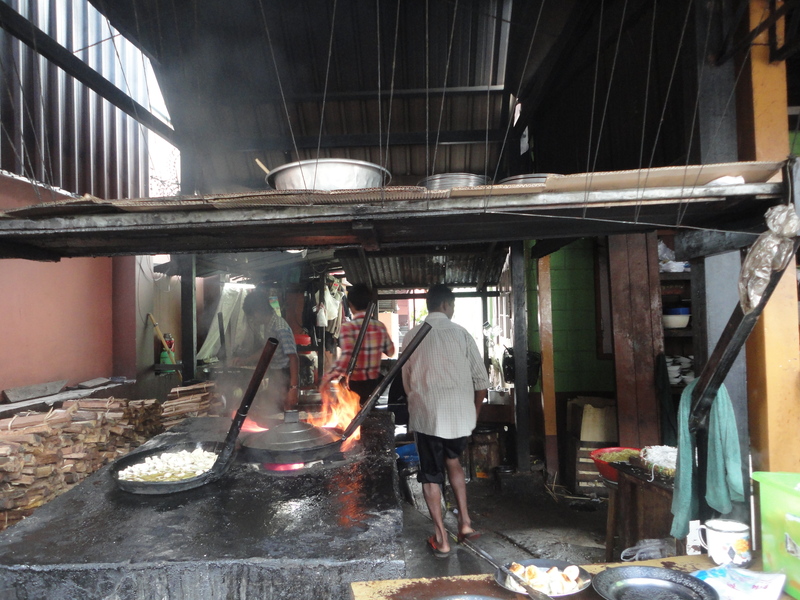 At the end of my one-week trip, I was lucky to have tried both home-cooked meals and street foods. 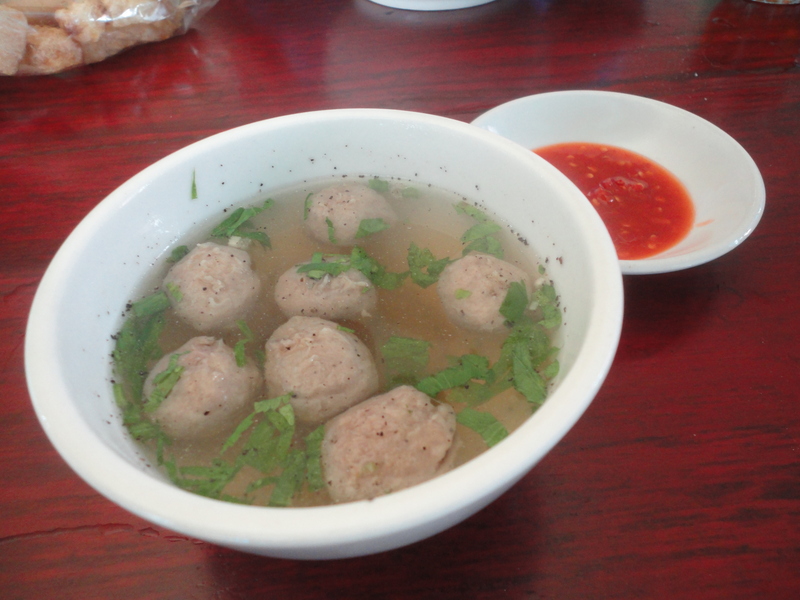 What strikes me was the number of various dishes in a regular meal: usually 3-4 mains (different curry-based dishes and other fried meat), soup and a bunch of appetizers (pickled vegetables and boiled greens to dip in fermented shrimp or fish paste). I won’t even want to think about the number of plates they have to wash after that. 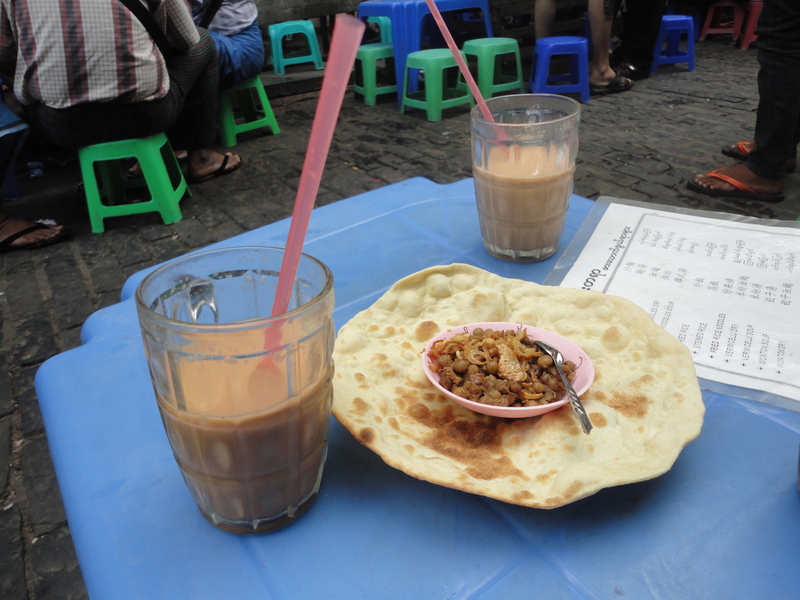 Additionally, restaurants or even small shops will give you complementary items like hot tea and salads (pickled tea leave salad being the most popular). Apparently that makes us slow down and enjoy all the food, which I believe is the purpose of meals. 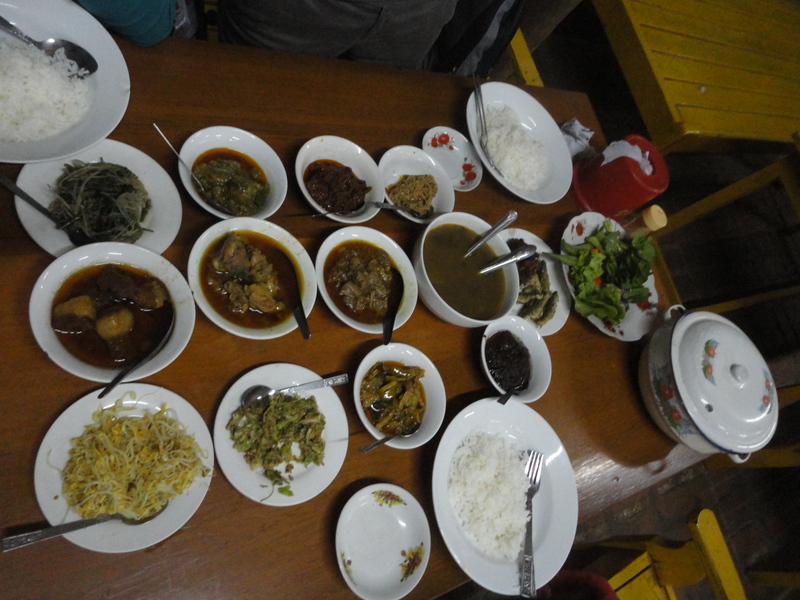 Our feast on the first night in Bagan. 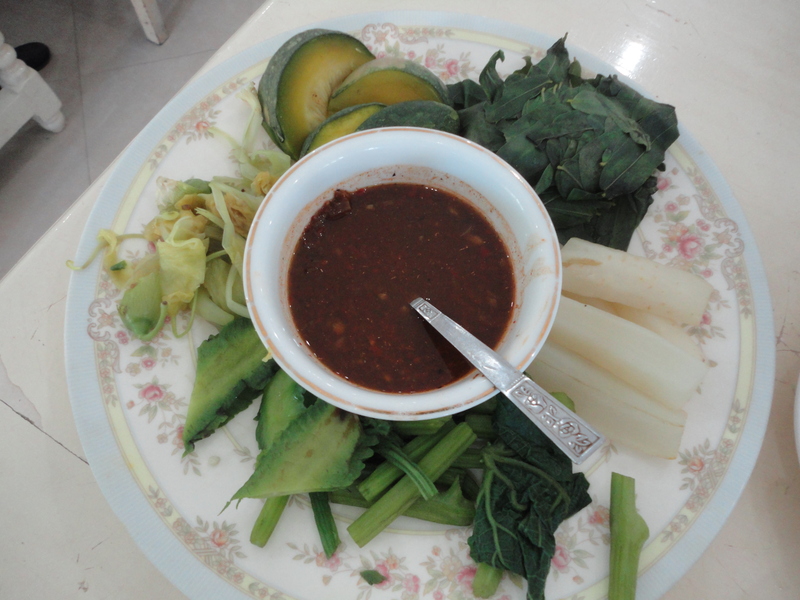 A typical plate of boiled vegetables. You may have noticed that I haven’t talked about things like layphat htote (tea leave salad) or mohinga, and I’m not going to (although I did eat both). These dishes have had their attention, and I think it is time to savor other options out there. They could be absolutely amazing or they could be terribly weird, who knows? But what could be more fun than exploring the unknown and trying something for the first time? I ate new things, climbed mountain for the first time and watched hot-aired balloons taking off knowing they may burst into flames any moment. What could be more fun than that? PS: Happy new year! More fun, peace and love for everyone!